Vangelis comes with more than 20 years legal , business and real estate experience with a focus on top professional service to all local and international clients. Vangelis and his Team offers a bespoke service to all clients wanting to sell or buy with a personal professional approach. 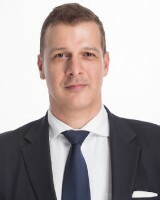 If you wish to sell your unit or want to buy in the buildings we operate in or in the surrounding areas, please feel free to speak to Vangelis directly.